Growing up as a Protestant made me leery of Christian Saints, especially Mary the mother of Jesus. I was told that others prayed to and worshiped her but that we only venerate Jesus. I think most Catholics would chuckle at my Baptist/Mennonite understanding of their tradition. But as much as I agree that we’re called to worship God alone, there’s a part of me that longs to connect with a faith tradition that goes deeper than Sola Scriptura and my own personal relationship with Christ. We actually have much to learn from the saints (which for me includes all people of faith who have gone before us) because at their point in history, God called them and partnered with them to bring His kingdom into this world. They have walked the roads we now walk and have much to teach us about how God works in our lives. For reasons only known to God, whenever He works in the world, He partners with His creation rather than just doing things on His own. Most of the Bible consists of stories of ordinary and unqualified people who were chosen to speak and/or work on behalf of God for His kingdom and glory. When it comes to Mary, it’s no different. In fact, she holds a special place as being chosen by God to incarnate the divine. 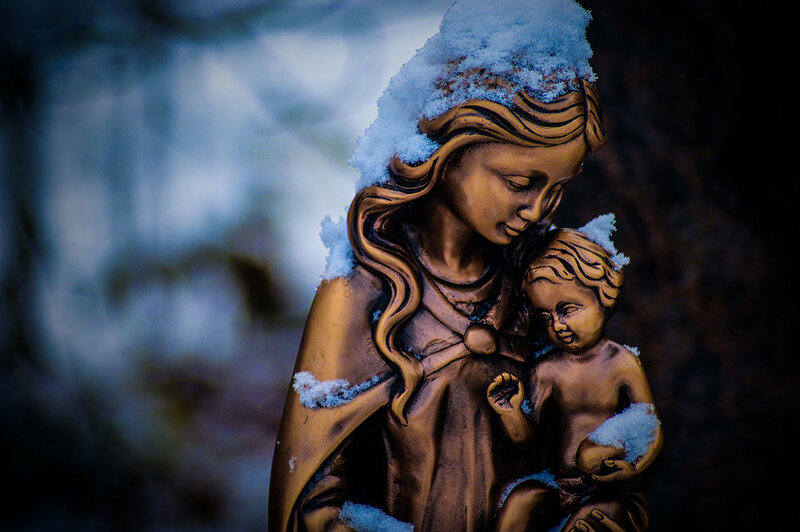 When we read and re-read the story of Mary and her family every Christmas (Luke 1-2), we may miss the significance of the partnership between her and God. There’s something about Mary and the way that God used her to bring Jesus into the world that draws us into relationship with Him. In very similar ways, God calls and uses us as well. God sent a messenger, Gabriel, to Nazareth to greet Mary and tell her about God’s plan. In the most literal sense, God showed up. Mary didn’t have to guess about what she was supposed to do. She had no doubt about where the message was coming from. She knew God called her. In a similar way, God has made Himself known to us today. Through Jesus, Scripture, Creation and the Church, we hear the call of every Christian. We may sometimes feel like we don’t know what that is, but the overarching message is abundantly clear. We should allow God to transform us to be Christ’s light in this world by being God’s witness and working for peace and reconciliation. We are to love all people and fight for justice for the poor, marginalized, and vulnerable. There’s nothing we read that explains why God chose Mary. All we know is that God did. I’m sure there were other women who were faithful and believed in God. But that’s not the point. God chose Mary because of who God is, not who she was. God has also chosen us as His family, adopted as brothers and sisters in Christ. That adoption wasn’t because of anything we’ve done, but because of what God decided to do for us. We are called to be Christ’s ambassadors in the world. That should make us humble because God doesn’t rely on us to do the job He calls us for. Mary questioned Gabriel about how it would be possible for her to conceive a child. She was unmarried and a virgin. Her understanding of reproduction meant she knew that she was not pregnant. But Gabriel told Mary about her relative, Elizabeth, who became pregnant in her old age. Gabriel tells Mary that it’s God who will make it happen. For God, nothing is impossible. I know how difficult it is for us to believe in the impossible. It doesn’t make logical or scientific sense. But when God calls us, He doesn’t expect us to figure it all out. He will do it through us. Sometimes He may even choose us because we aren’t qualified, so that there will be no doubt as to who is at work. This doesn’t mean that we can always do the impossible if we just believe in God, but that God will do the impossible through us when He call us to do it. Read Mary’s response to Gabriel’s words: “I am the Lord’s servant. May your word to me be fulfilled.” She didn’t get a how-to manual or prenatal classes. She didn’t go off and try to get pregnant. She simply believed God and accepted the call to partner with Him to bring this baby into the world. That was all that was expected of her. Later, Elizabeth blessed Mary because she believed the word of God. Mary then goes into her song (Magnificat) and praises God for what He has done in the world. We see Mary’s faith develop as she becomes pregnant, delivers Jesus in Bethlehem, loses Him in the temple at age 12, asks Him to turn water into wine at 30, and witnesses His crucifixion at 33. When God calls us, what is expected is faith. We don’t need to have it figured out. We don’t need all the answers. All we need to do it take God at His word and believe that He will show up and act. But as easy as it might be to talk about faith, it really comes into play when we find ourselves in desperate situations, wondering why we believed in the first place. For Mary and for us, the nurturing of that kind of faith takes a life time to develop. Jesus was the fulfillment of the promise that God made to Mary’s ancestors long ago. Through her, God fulfilled His promise to bless humanity. We all are now invited to live as a part of that story. When God calls us to be His witnesses and to work for peace and reconciliation, the result will be that the world will be blessed. People and relationships will be healed, fights will stop, the vulnerable will be honoured, the grieving will be comforted; all because we say yes to God’s call to partner with Him in bringing His message of healing and hope to the world. My prayer this Christmas, is that we would say “Yes” to God’s invitation. I pray that God would make Himself known in your life and show you how He can work through you, by faith, to bless others.